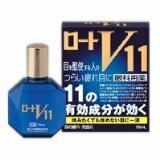 Top 3 Made in Japan Eye Drops! Hi, this Angela, born in Shanghai, raised in Canada and currently living in Japan! I’m not sure whether you are familiar about eye drops or not, but I certainly wasn’t until I came to Japan several years ago. I first came to Japan as an exchange student in one of the Universities in Tokyo, and what surprised me the most is the number of students who used eye drops. 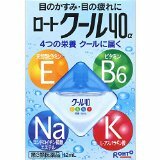 Using eye drops is like a habit for most Japanese people who do a lot of reading. I still remember the first several months on my job when I was sitting at the lawyers office with my client. I was surprised at the number of times the lawyer pulled out his bottle of eye drops over the course of an hour. Well, I’m not trying to say that everyone pulls out their eye drops during conferences in Japan, what I am trying to say is that there is a high demand for eye drops in Japan, which is possibly the reason why there are so many brands and varieties of eye drops, and on top of that, the eye drops aren’t a “one brand is effective against all symptoms” kind of eye drop, certain eye drops are more effective against certain symptoms. Well, so how do you which eye drops are effective against which symptoms when you don’t know Japanese? This is why I am going to introduce the Top 3 made in Japan eye drops for TIRED or STRAINED eyes. For people who eyes get red easily, click here for the relevant eye drops. If you are someone whose eyes get dried up easily, click here. Finally, for blurred vision from time to time, click here. This eye drop medication is the best in terms of cost performance. I tend to think of this as a daily supplement for the eye because it helps keep your eyes moisturized and nourished with the necessary vitamins and minerals. If you plan to use eye drops on a daily basis, and several times a day at that, I would highly recommend this eye drop. My friend carries this eye drop in her purse. It is a little on the expensive side compared to other eye drops on the market. However, it is very effective when you feel your eyes are a little strained. 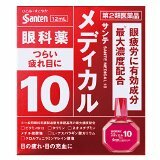 If you’re someone like me who doesn’t like to constantly use eye drops on a daily basis, I would recommend Sante Medical 10. Just one drop in each eye and you will feel the difference instantly. This eye drop is my personal favorite because it contains 11 components in total, in which 4 types are nutrients, and 3 types are disinfectants for the eye. When I don’t get enough sleep during spring/ summer season, my pollen allergy symptoms start to show, and my eyes start to itch. This eye drop not only provides the necessary nutrition for the eye, it also contains disinfectants which helps me and my pollen allergy symptoms. It works really well, but it is also a little on the expensive side. So unless you are like me, and have an allergy reaction that causes your eyes to itch from time to time, I would stick with either Rohto Cool 40 or Sante Medical 10. Just like your skin, keeping your eyes nice and moisturized on a daily basis is highly recommended, especially when the daily activities in your life require you to use your eyes a lot. I personally do a lot of reading and research since university, and even now, my job requires me to stare at the computer screen an average of 12 hours a day. Ever since I started using the eye drops, I became more efficient at work. Hence, I highly recommend you take the necessary precaution and protect your eyes before it develops into something more serious! I hope you liked my article! Let me know if you have any questions or concerns. Well, enjoy your time in Japan! Copyright © DoctorQ Japan | All you need to know about clinics and hospitals in Japan All Rights Reserved.